Just about the time you thought you've seen all the crazy sites out there on the web, along comes Av8rdan with a few that ought to provide a few pristine moments of enjoyment. I found these while surfing around thirtythousandfeet.com, one of my favorite aviation directories. A require stop at FL 300 is their new sites page, listing the freshest of their content. Rent a helicopter when you are in Brasov, or near by, will prove to be a fantastic opportunity to see the splendour and beauty of Bran Castle, also called Dracula Castle, the old Rasnov Citadel and the picturesque Brasov city from a bird's eye view. Love Air is a dating and friendship service designed for air crew, cabin crew, airline staff, private pilots, military pilots, flight operations staff, ATC, aircraft & aerospace engineers, general aviation staff and all supporting services. Love Air is not only about romance and flirtation, but also friendship. Many of our members use this site to meet up to fly or just to socialise. Register here to share your cabin crew pics, to talk about cabin crew jobs, and to discuss any aspect of airline life and general aviation. 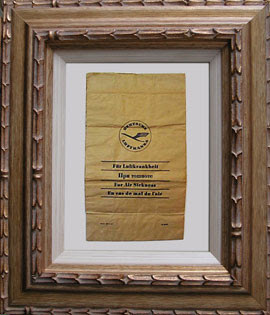 Air Sickness Bags are art! One can tell a lot about an airline's image from their Air Sickness Bags. Some barf bags are no more than a baggie with a twist tie, while other sickbags could win international design competitions. Are they art? You decide.